It’s not very often that visitors can find a fun and informative walking tour… for FREE! But that is exactly what Tour Guys offers; they provide multiple free Toronto walking tours as well as free walking tours in other Canadian cities. During our recent weekend in Toronto, Tour Guys invited us to join their free Downtown Toronto tour: Power, Politics, & The PATH. This tour focuses on architecture, current events (both political and financial), and Toronto’s underground city (aka “the PATH”). The starting point for the tour was inside Toronto’s Union Station. We got there a little early and used the time to wander around a bit. When we headed back over to the clock inside the Great Hall, Julian was already there waiting. We chatted a bit while we waited for everyone else to arrive. It was obvious that he loved Toronto and loved giving these tours. Once everyone was there, Julian began the tour by telling us about Union Station. Considered the most important building in Toronto’s history, he explained that had the station not been built, the city of Toronto would probably not exist. He also went on to tell us interesting tidbits, like the fact that there are misspellings carved into the stone! We headed out and started learning more about Toronto’s history. Julian was funny and knew so many quirky facts! Our next stop was the Fairmont Royal York. Did you know this hotel is the official royal residence of Queen Elizabeth when she’s in Toronto?? Next we headed down into “the PATH” which is a labyrinth of hallways and corridors that spans over 30 km. It has shops, restaurants, and access to public transit. According to the Guinness World Records, it’s the largest underground shopping complex in the world! The PATH is perfect for pedestrians to get around during Toronto’s cold winters and humid summers. During the week, the PATH sees over 200,000 commuters a day! As a lover of architecture, we loved hearing about Toronto’s continuous effort to create cutting-edge and innovative designs. The Royal Bank Plaza even has windows covered with a thin coating of 24-carat gold leaf. During our tour, we were even taken inside an underground vault. This vault was built right into the bedrock and has a 4 foot thick steel door that weighs 40 tons. Getting to sit inside of it was a really interesting experience! We also stopped by the Old City Hall building, which had a really crazy history. Talk about some drama!! We won’t spoil it for you, but we will say this… don’t ever piss off an architect or you will be immortalized in a very bad way! The tour ended at Nathan Phillips Square, home of the iconic Toronto sign as well as the new City Hall. Inside the lobby of City Hall is a really great mural called Metropolis and it is composed of over 100,000 nails. Its center is composed of massed copper nails which represent the heart of the city and surrounding that mass are expanding circles that represent suburban areas and neighborhoods. In total the tour ran just under two hours which we thought was the perfect length of time considering we were walking. And even though the weather was a bit cold, we were never outside for very long. What we loved most about this tour was that it wasn’t at all what we expected. Yes, we learned about the history of Toronto. But not the way you would from a textbook. We were told weird and funny stories. Stories that had us saying, “Oh my God, are you serious? ?” And the fact that you could tell Julian was having fun made it that much better. This is by far the best free walking tour we’ve ever been on; don’t for a second think that because it’s free that the quality will be any less. These guys love what they do and are proud of what they offer their guests (although we do suggest tipping what you feel their work was worth to you). 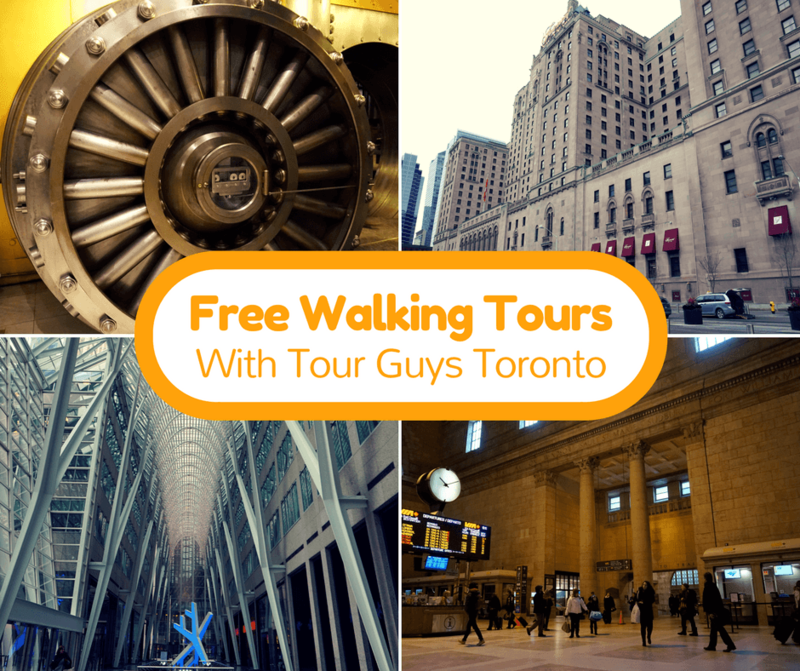 So if you are planning a visit to Toronto and want to get to know the city by foot and for free, make sure to book a tour with Tour Guys! I haven’t done this tour but I took a Street Art tour by the tour guys and agree that they are amazing! They are so informative and passionate about the city. Great summary! I’ll have to check this one out now! Oh awesome! I think the street art tour is something I’d like to check out next time we’re in Toronto. We were able to see some while we explored the city, but I’m sure we missed a lot. I hope to visit Toronto someday, and I like the idea of going on a city tour. But I have to admit I probably wouldn’t have chosen one with “politics” in the title. And yet, it sounded very interesting! Oh awesome! I went on a tour with this same company in Vancouver! They were great! I always make an effort to take a free walking tour in a new city. Not only do you learn cool facts, but you make a mental note of places to check out later! Great post. I think free walking tours are one of the best ways to get to know a new city. I’ve never been to Toronto (or anywhere in Canada) but it’s really high on my list. Especially since one of my best friends lives in Toronto- I need to make it out there soon! Local walking tours are a great way to get the background on a city’s culture and history without be tied to an organised tour. I love how you get little gems of information like the misspellings carved into Union Station that you’d never know about otherwise. It’s awesome that free walking tours are making their way around the world! Thanks for the post! Free walking tours are a great way to get know a city without spending a bundle. Every free walking tour I have been on has been great and really focuses on the history and location and not on selling me tourist junk. I will check them out and see if they have a tour in Montreal. Free price is my favourite price. Got to love that! I haven’t made it to Toronto in my travels yet, but I’ll be sure to keep this one in mind should I make it up there. Sounds like their passion for Toronto is infectious. How did I not ever know about The Path?! I’ve been to Toronto a few times and have never even heard of it. Further proof that these tours are wonderful opportunities to learn about a place, even one you’ve been to before! Wow, the Tour Guys really are providing an amazing service. Now I need to go on the tour so I can know about the drama! Must have been so insightful hearing all that good information from the experts. This looks like a great way to explore Toronto. Need to make it there one of these days. Love that you got quirky facts from your tour guide. Those are my favorite when I’m exploring a new city. Hello, I loved your blog, it’s beautiful and we felt like we were in the wonderful places too. I love traveling, and if it were possible I would live like that too. But we can travel with your posts. Your blog is charming! I’ve been looking for a great tour of Toronto to get me refreshed and looking at my local city from an outside perspective. This looks like an awesome way to explore the TDot! Hey Kevin! We definitely recommend doing it, even for locals. I feel like there’s always some new or quirky tidbit you can learn about your own city.